Baseball lovers and purists in Detroit still look for a lost treasure – the historical marker for Detroit Tiger Stadium, which was stolen one year ago this Memorial Day weekend. The only lead police have is that a Detroit police officer saw two white males, in broad daylight, with a white pick up style utility truck and a yellow top light backed up to the marker. He said they looked like they were doing their job so he didn’t challenge them. Only later did he learn that the marker was stolen. The State of Michigan Historical Marker for Detroit Tiger Stadium, which was bolted to the Trumbull side of Tiger Stadium was stolen over the Memorial Day weekend 2006, between Friday night and Tuesday morning. Peter C. Riley, president of Michigan & Trumbull LLC, a group dedicated to preserving historic Tiger Stadium and Executive Producer of the new Tiger Stadium documentary Stranded at the Corner, reported the theft to Detroit Police. Riley said he was devastated that this historical marker was stolen but not surprised. He said Mike Ilitch, owner of the Little Caesars Pizza and the Detroit Tigers and defacto custodian of Tiger Stadium and the City of Detroit since 1999, when the stadium closed, has failed to properly secure and maintain the historic Stadium. Mr. Riley argues that Mr. Ilitch has created an atmosphere, in which, a person or persons would think that since the stadium has been in a state of ‘demolition by neglect’ since 1999, it would be alright to remove the marker as a souvenir or scrap. 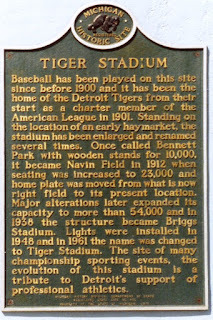 Laura Ashlee, of the State Historic Preservation Office, stated that the State has given no one permission to remove the marker and that the State of Michigan takes the theft seriously and that there are serious penalties for those found to have stolen, be in possession, to have damaged, or trying to sell the Tiger Stadium Historical Marker. Ashlee says the theft is a high misdemeanor crime, punishable by up to 93 days in jail and/or a $5,000 fine. Businesses or collectors who accept the Marker could face jail time and a fine of up to $10,000. Anyone with information about the Marker or the 40 other markers missing from around Michigan should contact Laura Ashlee (517–335–2725 from SHPO), any state or local police agency immediately. Michigan & Trumbull LLC and Peter C. Riley, this weekend increased its offer to a $3,000 reward for information leading to the return, arrest and conviction of anyone who stole the marker, is in possession of the marker or has damaged the marker. Riley can be contacted at (313–402–4565). FANTASTIC...GREAT...ARTICLE ON THE TIGER STADIUM HISTORICAL MARKER..
HOPEFULLY WITH THE EXPOSURE FROM YOUR BLOG..IT CAN BE RECOVERED.